A Durham woman has died from injuries that she sustained on Friday, March 11, during a head-on collision in Topsham. Christina Babnaw, 44, died in the hospital on Saturday night, March 12, as confirmed on Sunday morning by Topsham police Sgt. Mark Gilliam. The accident took place near the 800 block of Middlesex Road, according to town police. Babnaw was driving her 2009 Toyota sedan with one passenger, Joshua White, 21, also of Durham, in the car when she collided with a 2008 Hyundai SUV driven by Bruce Hanson, 65, of Harpswell. With him in the car was Taylor Hanson, 32. Only one of the four parties involved in the accident was wearing seat belt; however, authorities did not name that individual. Fire emergency vehicles were called to extract both drivers, who were trapped in the vehicles. Both passengers were able to exit the vehicles on their own. Joshua White, Bruce Hanson, and Taylor Hanson were all treated at the hospital for non-life threatening injuries. By Sunday, White, who had suffered a broken pelvis, and Bruce Hanson were listed in satisfactory condition. Taylor Hanson had been released. Police believe that speed may have been a central factor in the crash and that Babnaw may have been trying to catch up with another vehicle. The collision occurred when Babnaw veered off the right side of the road and then crashed into an oncoming vehicle as she reentered the roadway. Failing to stay in one’s lane and running in to on-coming traffic is one of the typical causes of head-on collisions. Such a failure may occur because of driver distraction (including use of phones or other hand-held devices) or impairment (as in a drunk driving case). In some cases, poorly marked roadways or lack of accurate signs may also be a culprit. A driver who strikes another vehicle head-on due to distraction, impairment, or recklessness of any kind may be liable in a court of law for the injuries or fatalities that occurred as a result of his or her negligence. In certain situations, accidents that result in significant injuries and/or death may warrant legal action if negligence was a contributing factor. 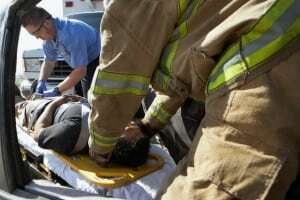 A successful car accident lawsuit may seek damages for medical expenses or long term rehabilitation costs, loss of income or earning potential, pain and suffering, loss of quality of life, loss of consortium, wrongful death, and other losses. If you or a loved one have suffered serious injury in a head-on collision as the the result of another driver’s negligent behavior, contact the Maine personal injury lawyers at Hardy, Wolf & Downing. A free case review can be set up at your convenience by dialing 1-800-INJURED.